Do you ever virtually shop on Pinterest? 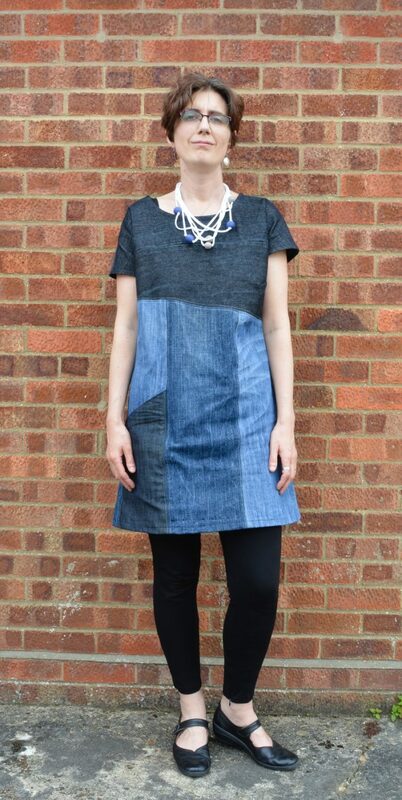 For some time I have contemplated making a block denim dress, in particular the pattern Essential Denim Dress from Sewdifferent. I have finally done it!! 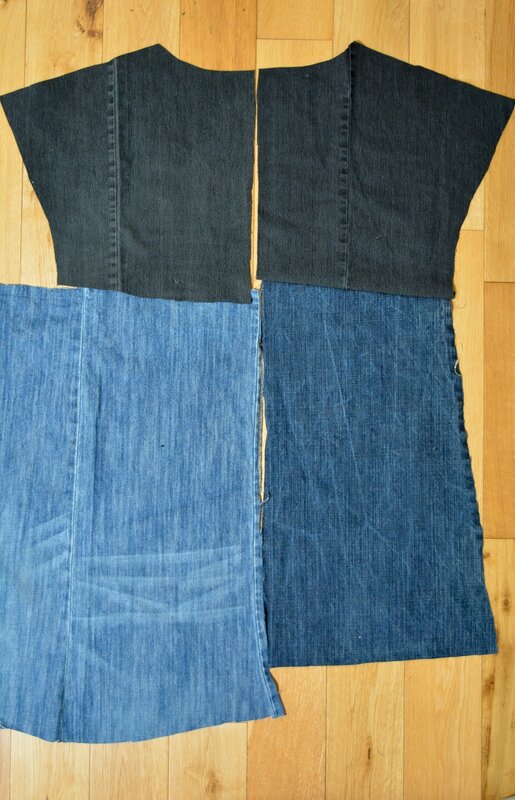 The dress I have made is made six old pairs of jeans!! The pattern covers sizes 8-22, a great range. It prints off clearly, this pattern prints all sizes (some more recent PDF patterns you can choose to print only the size you want). The sewing instructions clearly show you how to piece together the various pieces. Described as an adventurous beginner I agree, the dress is straightforward to out together, no zip in sight! The pattern does make some assumptions regarding your knowledge of sewing with no suggestions how to finish your seams or how to apply bias binding to finish the neckline. So how did I get on?? 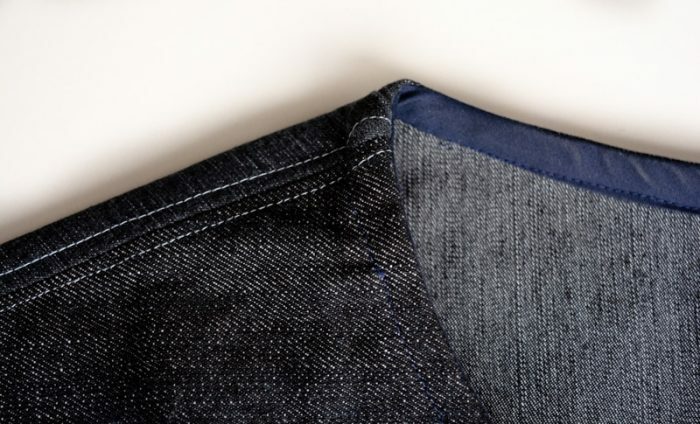 The back pattern piece is wide and long, which I was unable to achieve in one piece from a pair of jeans. Therefore I created blocks for the back, in keeping with the front design. The seams for the dress I top stitched, the seams from the original jeans I left therefore differentiating the two types of seams apart. When it came to hemming the neck and sleeves with bias binding I did a quick google search and followed these instructions from Sew It Over. I overlocked the hem before turning up and machine stitching in place. 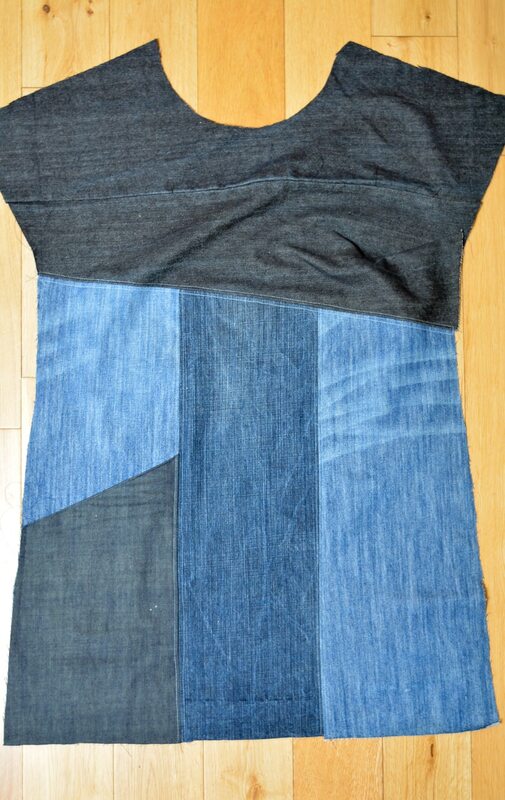 The layout of different jeans with their different weights, stretch and colour I am delighted with. Handy as I had only just enough denim to make the dress!! 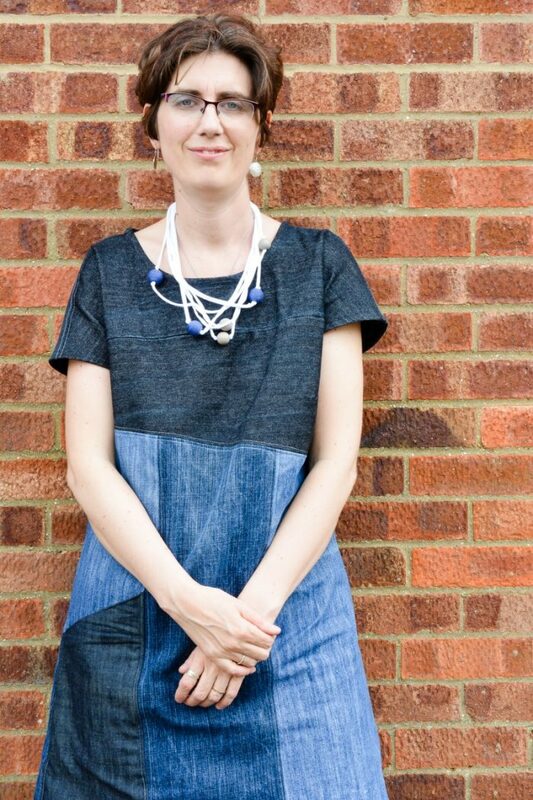 Overall I am delighted with the Essential Denim Dress pattern and the end result. Its great to have a pattern where you can piece together various recycled fabrics. Any gaps in sewing knowledge can be easily found on line. 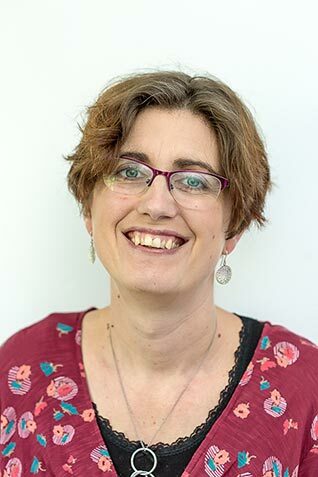 Having loved the pattern for too long an upcycling competition being held by the Sewing Directory and Korbond has provided the impetus to make it. You still have time to enter, the deadline is tomorrow!! The necklace is made from an old t -shirt, find a tutorial to make your own here. I encourage you to go and make whatever it is you have been coveting on Pinterest for far too long!! Can’t believe you were cutting the pattern out last night and have a finished dress today!! I love denim and your dress is awesome! So cute, will try it. Great – enjoy your sewing. An awesome refashion, Vicky!!! Looks great paired with the leggings. The combination of the different colours really makes this dress. Thanks Pam – can’t quite believe it took me so many years to make it! I love this, especially that you’ve upcycled jeans! I have a few I’ve been saving for something, maybe this! Beautiful work! 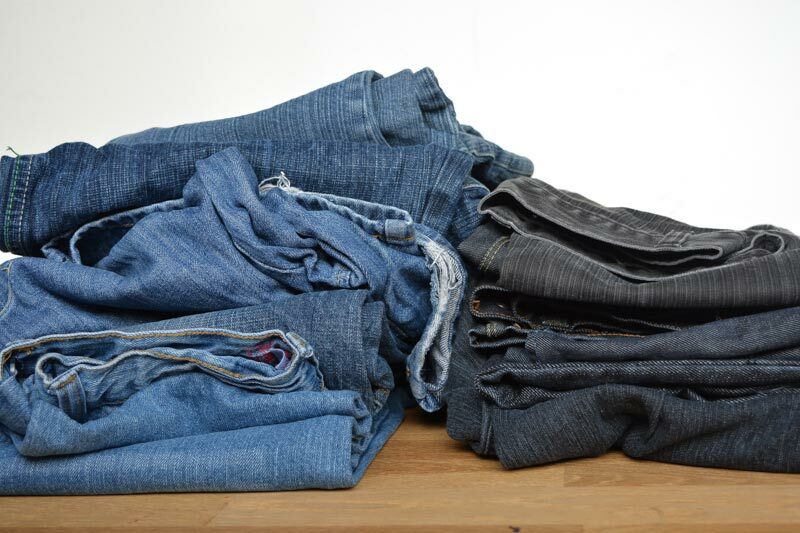 You can never have too many jeans in your stash!! It looks awesome. All the different colours are matching beautiful together. Wishing you all the best for the competition. Perfect! Me gusta mucho el resultado! Thanks so much for sharing Laura, plus your kind offer of a pattern;) I will have a look! Love it. Got to make me a dress like this. WOW!